Researchers at the University of Colorado suggest that the portion of the brain devoted to hearing can become reorganized, reassigned to other functions, even with early-stage hearing loss, and may play a role in cognitive decline. The team state that they have applied fundamental principles of neuroplasticity, the ability of the brain to forge new connections, to determine the ways it adapts to hearing loss, as well as the consequences of those changes. The current study will be presented during the 169th meeting of the Acoustical Society of America (ASA). The current study centers on electroencephalographic (EEG) recordings of adults and children with deafness and lesser hearing loss, to gain insights into the ways their brains respond differently from those of people with normal hearing. EEG recordings involve placing multiple tiny sensors, as many as 128, on the scalp, which allows researchers to measure brain activity in response to sound simulation. The team explain that the sound simulation was delivered via speakers to elicit a response in the form of brain waves that originate in the auditory cortex, the most important center for processing speech and language, and other areas of the brain. In this way the researchers state they were able to examine certain biomarkers of cortical functioning, which showed how the hearing portion of a deaf person’s brain is functioning compared to a person with normal hearing. Previous studies have identified the areas of the brain responsible for processing vision or touch can recruit, or take over, areas in which hearing is normally processed, but which receive little or no stimulation in deafness. This is called ‘cross-modal’ cortical reorganization and reflects a fundamental property of the brain to compensate in response to its environment. Earlier studies have shown that this kind of compensatory adaptation may significantly decrease the brain’s available resources for processing sound and can affect a deaf patient’s ability to effectively perceive speech with their cochlear implants. Cochlear implants are implanted devices that bypass damaged portions of the ear and directly stimulate the auditory nerve. Signals generated by the implant are sent by way of the auditory nerve to the brain, which recognizes the signals as sound, according to the National Institutes of Health. The current study shows that cross-modal recruitment of the hearing portion of the brain by the senses of vision and touch happens not only in deaf patients, but is also clearly apparent in adult patients with only a mild degree of hearing loss. The hearing areas of the brain shrink in age-related hearing loss, state the team. They go on to add that centers of the brain that are typically used for higher-level decision-making are then activated in just hearing sounds. The results suggests that the portion of the brain used for hearing can become reorganized, even in earliest stages of age-related hearing loss. And, these compensatory changes increase the overall load on the brains of aging adults. The team state that this finding has important clinical implications for developing early screening programs for hearing loss in adults and that compensatory brain reorganization secondary to hearing loss may also be a factor in explaining recent reports in the literature that show age-related hearing loss is significantly correlated with dementia. Further, the results suggest that age-related hearing loss must be taken seriously, even in its earliest stages. One in three adults over the age of 60 has age-related hearing loss, the team note. Given that even small degrees of hearing loss can cause secondary changes in the brain, hearing screenings for adults and intervention in the form of hearing aids should be considered much earlier to protect against reorganization of the brain. The team state that they have demonstrated that charting brain functioning in patients with cochlear implants is a valuable tool to help predict their outcomes. They add that if a deaf child shows cross-modal reorganization by vision, for example, it allows the medical team to determine the optimal rehabilitation strategy for that particular child. Next, the researchers will continue to explore fundamental aspects of neuroplasticity in deafness that may help improve outcomes for children and adults with hearing loss and deafness. Their goal is to develop user-friendly EEG technologies, to allow clinicians to easily ‘image’ the brains of individual patients with hearing loss to determine whether and to what degree their brains have become reorganized. In this way, state the team, the blueprint of brain reorganization can guide clinical intervention for patients with hearing loss. A good performer with the cochlear implant shows normal brain activations in response to visual and somatosensory (touch) stimulation. 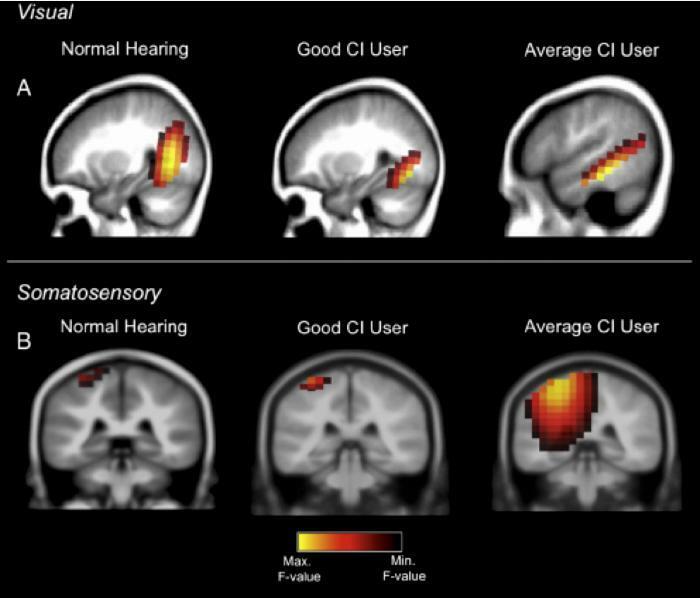 A cochlear implant user who performs averagely, however, shows additional recruitment of hearing brain centers for processing vision and tactile stimulation. Credit: Anu Sharma.